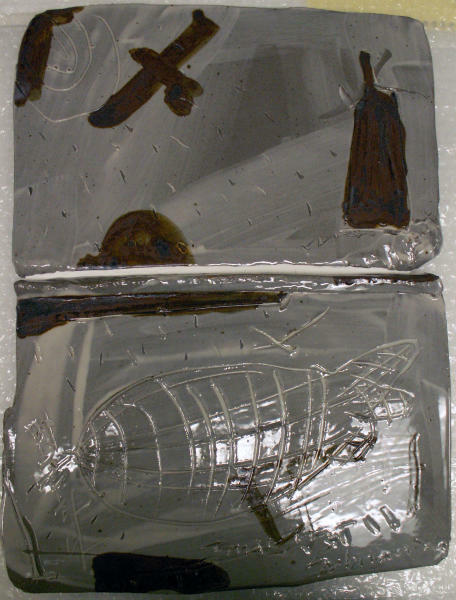 Stoneware sculpture, gray, with dark, printed shapes in upper half. Imprint of submarine at bottom half. Hoon Lee earned his undergraduate degrees in his home nation of South Korea and traveled to complete his master's degree at the prestigious school of ceramics at Alfred University in upstate New York. Lee's artistic production involves a variety of materials and techniques, ranging from traditional Korean ceramic and glaze production, slip cast ceramic multiples, and video documented performances that utilize unexpected materials like milk and cake frosting. The artist is currently the head of the Grand Valley State University ceramics department, playing a vital role in facilitating traditional technical skills and avant-garde conceptual practices.